Once you know the scenario and the number of ports you need on the gateway, use our configuration wizard to design the right beroNet gateway. 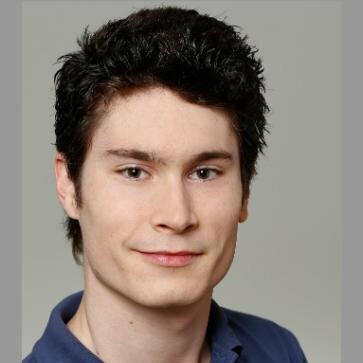 In this case, the client has a traditional telecommunication connection, not compatible with VoIP, that he wants to connect to an IPBX, which is not compatible with PSTN. Here, the client has either analog lines or ISDN ones. We know this for sure: your client needs an ISDN gateway. If they also have analog endpoints, check below. In ISDN, there are two kinds of lines: BRI (basic rate interface) and PRI (primary rate interface also called E1 in Europe and T1 in the USA). You then either know if the end client has so many BRI / PRI lines or you know how many simultaneous calls the clients can make. The client can make 8 concurrent calls. He most probably has 4 BRI lines. You then need a 4 BRI Gateway. If the PBX has 2 PRI lines, you need a 2 PRI Gateway. 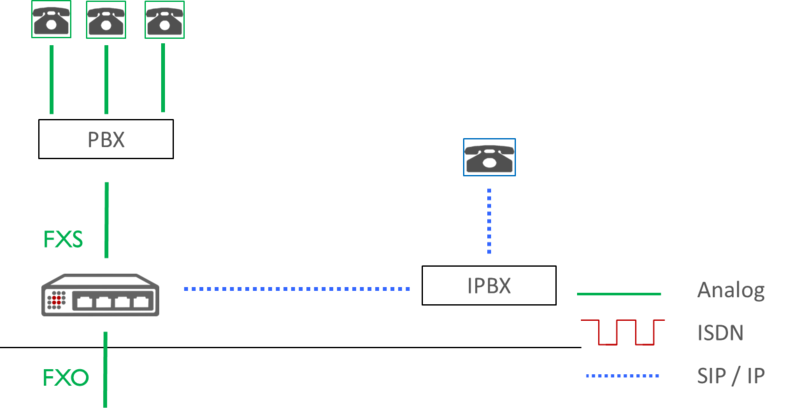 In order to connect an analog line to an IPBX, you need an FXO Gateway. With one analog line you can make only one call. It is then easy to find out how many ports you need to have on the gateway. 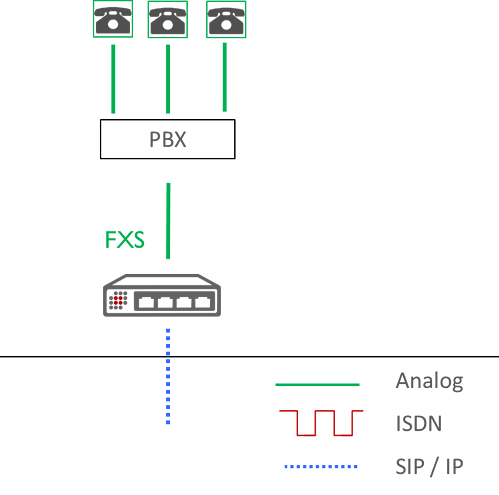 To connect analog devices to an IPBX, you need an FXS Gateway. 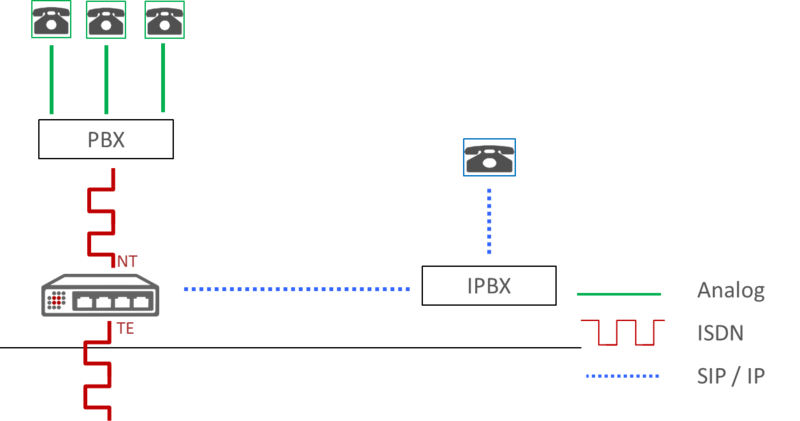 The number of ports you need depends on the number of analog devices you want to connect to the IPBX. If you want to connect an other analog device, just contact us and we'll check if it works. ISDN: the beroNet ISDN Gateways can work in NT or TE meaning that they can simulate the ISDN provider or the PBX. 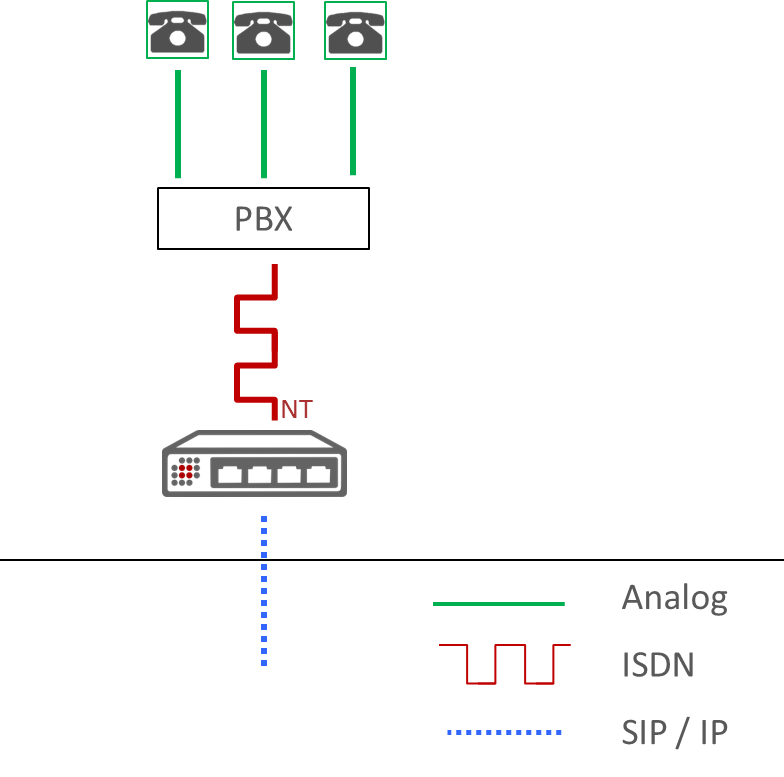 If the PBX used in the soft migration is an ISDN one, then you need to find out the type of lines it is connected to (BRI or PRI). Once we know the type of lines and the number of lines we know the kind of gateway we'll need. 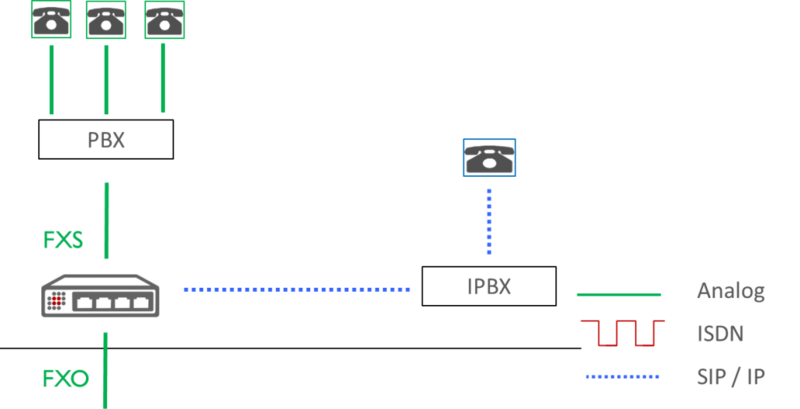 Example: if the PBX has 1 PRI, you will need a gateway with 2 PRI (one port in each direction). Analog: You will need a gateway with FXO and FXS ports. 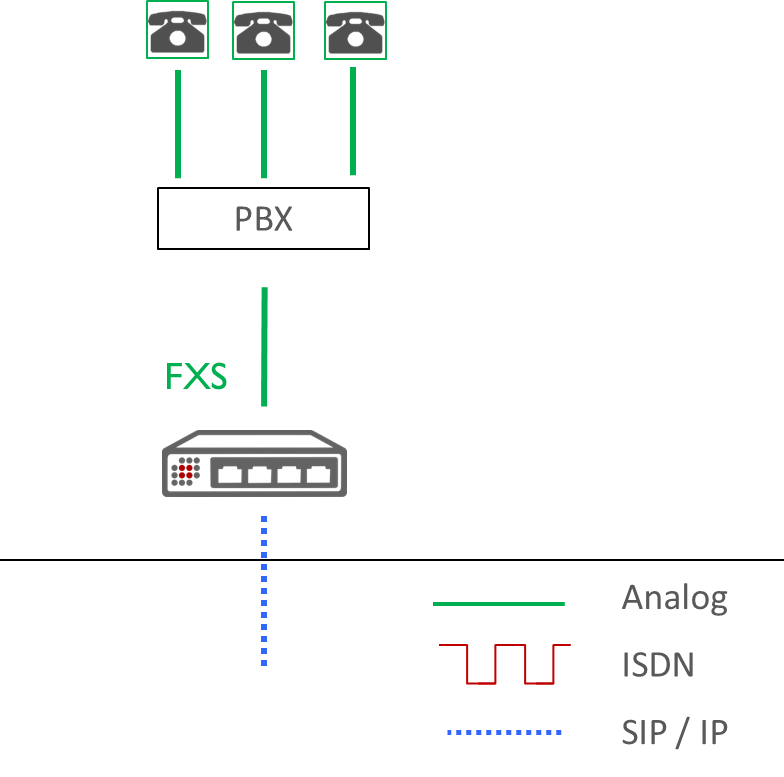 You will connect your analog provider line to the FXO ports and the PBX to the FXS ports of the gateway. You only need to find out how many ports you need. Analog: you will need an FXS Gateway. The number of ports in the gateway depends on the number of concurrent calls the PBX can make. beroNet modular gateways enable you to create the gateway of your choice depending on your clients needs.